Violent World or Violent Media? Col. Muammar el-Qaddafi, Libya’s overthrown dictator, was killed today near his hometown of Surt. Nearly 3 weeks ago, Anwar al-Awlaki, a senior leader of Al-Qaeda was killed by a drone strike in Yemen. At the end of July, a right-wing extremist planned and executed terrorist attacks in Norway, killing nearly 80 people. In May, President Obama announced that al-Qaeda leader Osama bin Laden had been discovered and killed. These are just a few of the events that have occurred in the past 5 months. The Wars in Iraq and Afghanistan, the Colombian Armed Conflict, the Somali Civil War, and several other international conflicts have been on going for several years. Violence, no matter the reason behind it, is everywhere. Or is it? Could it just be the media hyping up the conflicts when the world is actually pretty safe? Cultivation theory, in the field of communications, looks at the long-term effects of television viewing on people’s thoughts and ideas, and one of the ideas that arose out of the theory is the “Mean World Syndrome.” It claims that people who watch a lot of television today are more likely to think that the world is a terrible place because of media coverage of violent incidents. I found some proof to support the idea that media hypes up terrorist and other violent attacks in an article I read in The New Yorker a few weeks ago. Elizabeth Kolbert, in a piece titled “Peace In Our Time” profiled Stephen Pinker (pictured on right) and his new book on the history of violence, The Better Angels of Our Nature: Why Violence has Declined, and asked for his take on the Norway shooting in July. Clearly judging by the title, Pinker, a Harvard University professor of psychology, believes that violence in the world has declined. He also believes that the shooting was over-hyped. His argument, at least as showcased in Kolbert’s piece, is largely an historical one. He cites the fact that the European countries, for much of history, had been in constant, bloody war (100 years war, 30 years war, First and Second World Wars, to name a few), but now Norway is not only one of the safest places in the world but is probably the safest it has ever been in the history of its existence. According to him, nearly 300 people in Norway die yearly from accidents, so why is the death of the 77 people in the shooting so important? The answer: civilization. Civil-ization. As time went on, and people became more civil and educated (about everything), the way they began to think about others and behave towards others also changed. 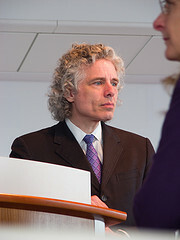 Literacy, the progress of civilization from feudal-states to more unified government, and the population burst are all reasons, according to Pinker, that contribute to people becoming more considerate of others. There are several gaps in Pinker’s analysis, according to Kolbert (and I agree). For instance, he fails to mention historical evidence from anywhere except Europe. Even in regards to European history, he skips over the issue of colonialism, a pursuit that resulted in tremendous violence. If there is evidence to support the fact that we live in a world that is less violent than in the past, why are we still affected by the events that unfold? Apart from the fact that we are human and we empathize with others? While education and civilization has allowed us to care about each other, it has also allowed us to be more technologically advanced. And much of this advancement is made in the field of weapons. It’s difficult for us to congratulate ourselves on becoming less like our feudal ancestors while simultaneously developing ways to destroy each other in more brutal ways than our ancestors did. Nice articles. Didnt know so much about Capsacain – Did I spell that right?